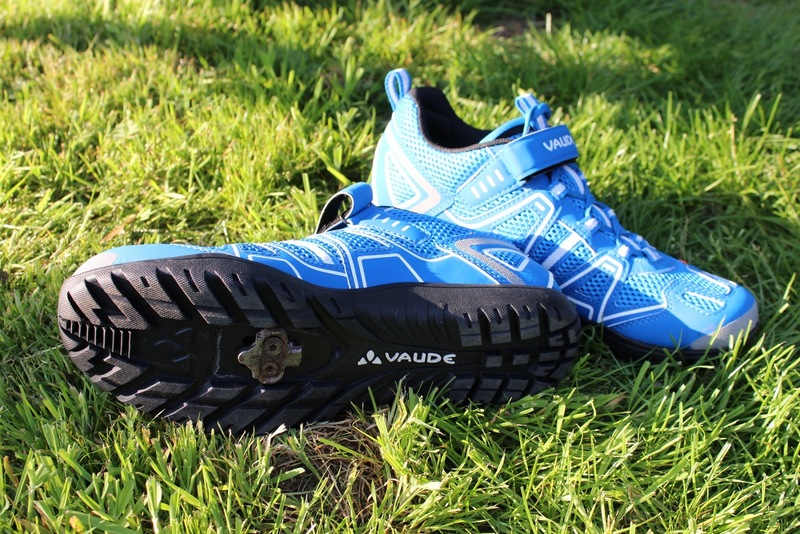 The Vaude Yara TR Bike Shoes are the most non-bike shoe looking cycling shoes that I have owned to date, and that is why they are great. The Yara TR shoes don't have to be used with clip-in pedals. Out of the box they have a rubber cover glued over the two-bolt SPD plate, so you could just use them like normal trainers. However, it is super easy to remove this cover, and to then bolt on some SPD cleats; these sit neatly recessed into the sole, to avoid pressure points and clinking when walking off the bike. On the bike, the Vaude Yara TR provide good foot support and performance. The soles are admittedly softer and more flexible than out-and-out mountain bike race shoes; so you'll notice that power transfer does feel a little less direct, and if you have them setup with cleats, then you get a bit more of a pressure point on the ball of the foot (rather than the pressure being spread throughout a stiffer sole). The shoe is secured with traditional laces and a velcro strap. These fastenings provide a secure hold for the foot, whilst also allowing plenty of adjustably to different foot shapes. Despite not having a rigid heel cup like many mountain biking shoes, the Yara TR shoes feel nicely supportive around the heel; the velcro strap aids this, and helps to hold the foot firmly when pedalling. The Yara TR shoes really come in to their own with their versatility though; because they can also be worn off the bike, comfortably. The soft rubber soles are far more flexible than those of most cycling shoes, and as a result you don't walk around off the bike looking like a flat footed penguin. The grooved rubber tread also provides more grip on slippery surfaces than most hard soled cycling shoes. This means they're a lot safer on those shiny supermarket floors, or walking up stairs; it made a notable difference to my confidence walking across our office building's glass atrium floor. The Yara TR shoes come up a little larger than most dedicated cycle race shoes. That is a good thing though, given that you're most likely to be wearing them off the bike a bit, so you don't want them fitting like a second skin. The added room in the shoes' uppers gave me enough space to fit some Superfeet insoles (read my post on 'The Benefits of Custom Insoles'). These provide a bit more arch support and a bit more cushioning than the stock insoles, which helps to make them even more comfortable to ride in when set up with SPD cleats. The only modification I might make to these shoes, is to fit a set of elastic laces, like UP Lock Laces. This is because the standard laces are a bit of a fiddle if you just want to slip the shoes on for a quick errand run; and also because elastic laces like these tend to provide a more even distribution of pressure on the foot upper (a reason BOA laces are used on many dedicated cycling shoes). 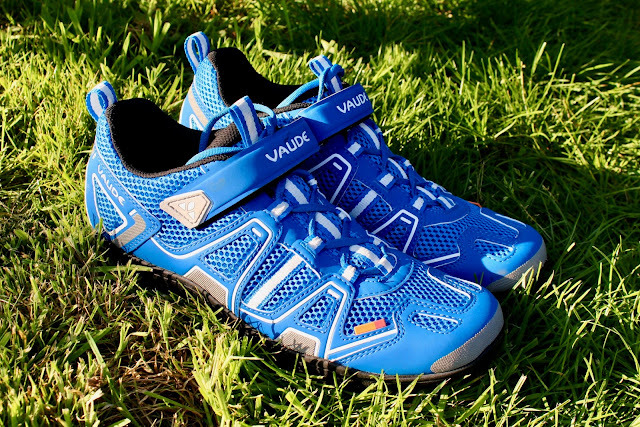 Overall, these are a great quality set of versatile bike shoes. Comfortable to be worn for decent distances on the bike, when fitted out with SPD cleats; whilst also comfortable to walk around in off the bike, whether that is shopping, sight-seeing or commuting. 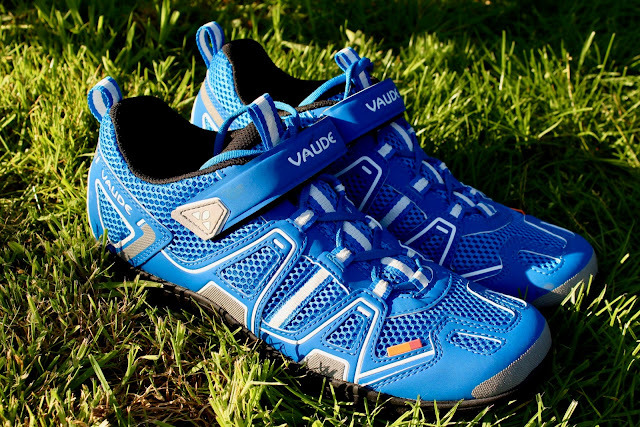 Avoid the need to take a pair of off-the-bike shoes with you when you go touring or commuting; the Vaude Yara TR shoes are a two-in-one winner. Great support, great looks, and great comfort - both on and off the bike.